An PPB lawmaker claims Savchenko called for a coup. Verkhovna Rada deputy Tetyana Rychkova accused MP Nadiya Savchenko of inciting the ATO troops to abandon their position near the Donetsk airport and go to Kyiv to overthrow the government. 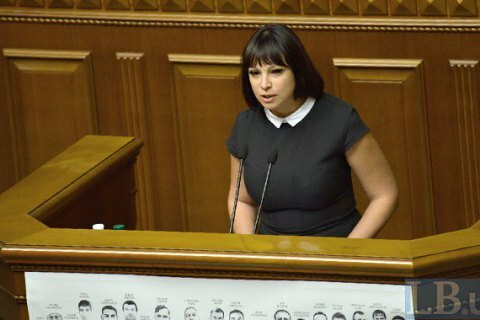 Speaking in the parliament on Friday, February 24, Rychkova claimed that Savchenko called for rebellion as she spoke to the servicemen of the 79-th and 80-th brigades. Savchenko may face the charges of actions aimed at violent change or overthrow of the constitutional order or the seizure of state power, Rychkova said, and suggested that the General Prosecutor's Office and the SBU should investigate into the actions of Savchenko. Last December, Savchenko secretly visited Minsk and met with the leaders of the Donbas separatist republics. In January, Savchenko published the lists of prisoners subject to exchange in defiance of the position of the Security Service.